سیاه‌منصوری, اصغر, قربانی, احمد. (1392). بررسی رفتار نمونه‌های بتن درزه‌دار با استفاده از روش‌های سرعت موج تراکمی و مقاومت ویژه الکتریکی. 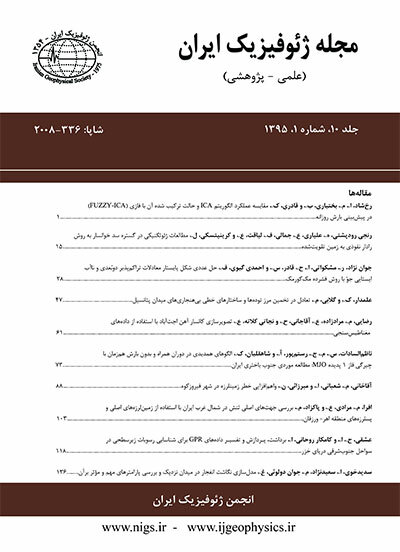 مجله ژئوفیزیک ایران, 7(3), 25-35. اصغر سیاه‌منصوری; احمد قربانی. "بررسی رفتار نمونه‌های بتن درزه‌دار با استفاده از روش‌های سرعت موج تراکمی و مقاومت ویژه الکتریکی". مجله ژئوفیزیک ایران, 7, 3, 1392, 25-35. سیاه‌منصوری, اصغر, قربانی, احمد. (1392). 'بررسی رفتار نمونه‌های بتن درزه‌دار با استفاده از روش‌های سرعت موج تراکمی و مقاومت ویژه الکتریکی', مجله ژئوفیزیک ایران, 7(3), pp. 25-35. سیاه‌منصوری, اصغر, قربانی, احمد. بررسی رفتار نمونه‌های بتن درزه‌دار با استفاده از روش‌های سرعت موج تراکمی و مقاومت ویژه الکتریکی. مجله ژئوفیزیک ایران, 1392; 7(3): 25-35. بررسی درز‌‌‌ها و ناپیوستگی‌ها بر خواص فیزیکی سنگ، برای درک بسیاری از مشکلات کلیدی در زلزله‌شناسی، آتشفشان‌شناسی و ژئوتکنیک ضروری است. در سال‌های اخیر استفاده از روش‌های ژئوفیزیکی برای برآورد ویژگی‌های فیزیکی و مکانیکی سنگ‌ها، به‌‌دلیل مزایای آن گسترش یافته است. در تحقیقات گذشته، میزان تخلخل سنگ را با استفاده از سرعت موج تراکمی با روابط تجربی برآورد کرده‌اند. همچنین روابط بسیاری برای ارتباط میان مقاومت ویژه الکتریکی و تخلخل عرضه شده است. در این تحقیقات، اثر درزه و ناپیوستگی‌ها در نظرگرفته نشده است. در این مقاله به‌‌منظور اثردهی ناپیوستگی‌ها در نمونه‌های آزمایشگاهی، از مدل‌سازی فیزیکی سنگ (ریزدانه و درشت‌دانه) با نمونه‌های بتنی و ناپیوستگی‌های مصنوعی استفاده شده است. بدین‌‌منظور تعداد 20 نمونه بتنی استوانه‌ای، طبق استاندارد NQ ISRM در آزمایشگاه تهیه شد. درزه‌های مصنوعی با ابعاد متفاوت در هنگام ساخت نمونه در آن قرار داده شد. نمونه‌‌‌ها به مدت 6 روز در آب قرار داده شدند و پس از خارج شدن از آب، به‌‌مدت 24 ساعت تا خشک شدن کامل در گرمکن گذاشته شدند، و سپس در حالت خشک و اشباع، سرعت موج کشسان تراکمی و مقاومت ویژه الکتریکی اندازه‌گیری شد. اندازه‌گیری سرعت موج تراکمی روشن ساخت که با توجه به رابطه ریمر و همکاران، رفتار درزه (ناپیوستگی) با ضریب اصطکاک کم (وجود یونولیت، طلق نازک و کاغذ برای ایجاد درزه) در نمونه‌ها، شبیه وجود آب در منافذ نمونه بدون درزه است. آهنگ کاهش سرعت موج تراکمی با افزایش چگالی درزه‌داری در نمونه‌های خشک بیشتر از نمونه‌های اشباع است. افزایش چگالی درزه‌داری (درزه‌های ترنشو: درزه‌های پرشده با یونولیت، طلق نازک و کاغذ) در نمونه‌های اشباع باعث افزایش مقاومت ویژه الکتریکی با رابطه لگاریتمی با ضریب همبستگی 97/0 درصد می‌شود. Recent developments in making new devices for geophysical surveys and the low costs of these surveys have made the geophysical methods such as compression sound waves velocity (P) and electrical resistivity (ρ) very common in the estimation of physical and mechanical properties of rocks. Raymer and colleagues proposed two new relationships between porosity and compression waves for low porosities and very high porosities. They used an interpolation method to estimate an average porosity between two limits. Studies have shown a good correlation (usually between 0.7 and 0.8) between the physical properties of rocks and the compression sound wave velocity. Compression sound wave velocity is a measure of intact rock wave velocity. Therefore, ignoring the crack effects adumbrates the results and generalizes it to rock mass. In this study, we made some artificial fractures in concrete samples in order to study the effect of discontinuities on the physical properties (P wave and electrical resistivity) in laboratory. In order to provide concrete samples, both B and C mix designs for modeling the fine and coarse grain were prepared. To simulate the various discontinuities in the samples, materials with different cohesion and negligible density of viscosity were used. Paper and talc were used to simulate high and very low cohesions, respectively and foam (unolit) was used for distant discontinuities. To prepare the standard samples, templates were constructed according to the NQ ISRM Standard. 20 templates (the number of samples, including 10 for each mix design) were considered. After preparing the concrete mix design based on both B and C mix designs, and lubricating the templates, the concrete was poured along with placement of discontinuities and artificial porosity. The natural porosities of the samples were determined according to ISRM (1981). The Pundit Device was used to test the compression wave velocity according to the standard ASTM D2845 (1978). To measure the electrical resistivity of the samples, the standard ASTM D5334-08 (2001) was used. This test is done in the full saturation. Since the porosity between individual samples for each type (fine or coarse grain) is constant, an increase in the total porosity is the result of an increase in the number of artificial joints and pores. In other words, increasing the joints (discontinuities) and artificial pores, causes an increase in the total porosity in the samples and a reduction in the wave velocity. Saturated samples followed the empirical model of Raymer and colleagues very well. In case of the specimens with equal artificial pores and joints, the wave velocity in the saturated state was larger than that in the dry state. Changes in the compression wave velocity with an increase in the number of joints are greater in dry samples than in saturated samples. In other words, by increasing the number of the joints, the saturation effect of the fluid filling the pores becomes more obvious. The best fit of the data on the electrical resistivity and total porosity (or an increase in the ratio of the joint volume to the pore volume) is a logarithmic relationship that has a correlation coefficient at least equal to 0.97. Considering that water does not replace with the artificial discontinuities, electrical resistivity increases with an increase in discontinuities. قربانی، ا.، قاری، ح. ع. و نمیرانیان، ‌ا.، 1391، پایش مقاومت ویژه الکتریکی سنگ حین آزمایش مقاومت فشاری تک‌‌محوری در آزمایشگاه: مجله ژئوفیزیک ایران، 6(1)، 34-41. Archie, G. E., 1942, The electrical resistivity log as an aid in determining some reservoir characteristics: Transactions of the American Institute of Mining and Metallurgical Engineers/Petroleum Division,146, 54– 62. ASTM, 1978, Standard method for laboratory determination of pulse velocities and ultrasonic elastic constants of rocks: Annual Book of ASTM Standards, Part 19, D 2845-69, 356–363. ASTM, 2001, Standard test method for determination of electrical conductivity of soil and rock: Annual Book of ASTM Standards, Part 23, D 5334-08, 253–267. Castagna, J. P., Batzle, M. L., and Eastwood, R. L., 1985, Relationship between compressional and shear wave velocities in silicate rocks: Geophysics, 50, 571–581. Dong, X. Q., Bai, X. H., Lv, Y. K., 2011, The relationship between porosity and electrical resistivity in cemented soil polluted by vitriol: International Conference on Electric Technology and Civil Engineering (ICETCE), 874 – 876. Ghorbani, A., Cosenza, P., Revil, A., Zamora, M., Schmutz, M., Florsch, N., and Jougnot, D., 2009, Non-invasive monitoring of water content and textural changes in clay rocks using Spectral induced Polarization: a laboratory investigation. Applied Clay Science, 43(3e4), 493-502. Glover, P. W. J., Gomez, J. B., Meredith, P. G., Hayashi, K., Sammonds, P. R. and Murrell, S. A. F., 1997, Damage of saturated rocks undergoing triaxial deformation using complex electrical conductivity measurements: Experimental results, Phys. Chem. Earth, 22(1-2), 57-61. Griffiths, D. H., 1976, Application of electrical resistivity measurements for the determination of porosity and permeability in sand-stones: Geoexploration, 14, 207-213. Han, D., Nur, A., and Miran, D., 1986, Effects of porosity and clay content on wave velocities in sandstones: Geophysics, 51, 2093-2107. ISRM, 1981, Rock characterization testing and monitoring, In: Brown E .T. (ed) Pergamon press, Oxford, 211pp. Krief, M., Garta, J., Stellingwerf, J., and Venture, J., 1990, A petro physical interpretation using the velocities of P and S waves: The Log Analysis, 31, 355-369. Marion, D., and Jizba, D., 1996, Sonic velocity in carbonate sediments and rocks, Carbonate Seismology: SEG Geophysical Developments Series, 6, 75-92. Raymer, L. I., Hunt, E. R., and Gardner, J. S., 1980, An improved sonic transit time to porosity transform: paper p, in 21st Annual logging symposium transactions, Society of Professional Well log Analysis, 12. Tiab, D., and Donaldson, E. C., 2011, Petrophysics: Theory and Practice of Measuring Reservoir Rock and Fluid Transport Properties, 3rd Edition, Gulf Professional Publishing, 976 p.
Tosaya, C., and Nur, A., 1982, Effects of diagenesis and clays on compressional velocities in rocks: Geophysical Research Letters, 9(1), 5–8. Tucker, M. E., 2001, Sedimentary petrology an introduction, 3rd edition: Blackwell Science Publications. Turesson, A., 2006, Water content and porosity estimated from ground-penetrating radar and resistivity: Journal of Applied Geophysics, 58, 99–111. Vernik, L., and Nur, A., 1992, Petro physical classification of silicaclastics for lithology and porosity prediction from seismic velocities: Bulletin of the American Association of Petroleum Geologist, 76, 1295-1309. Wang, Z., and Nur, A., 1989, Seismic and acoustic velocities in reservoir rocks, volume 2: theoretical and model studies. Edited by Levin, F. K., Society of Exploration Geophysists. Wyllie, M. R. J., Gregory, A. R., and Gardner, L. W., 1956, Elastic wave velocities inheterogeneous and porous media: Geophysics, 21, (1), 41-70. Yang, C. C., and Chiang, C. T., 2005, On the relationship between pore structure and charge passed from RCPT in mineral-free cement-based materials: Materials Chemistry and Physics, 93, 202–207.